You are here: Home / Featured Items / Home Décor / Trunk or Treat? 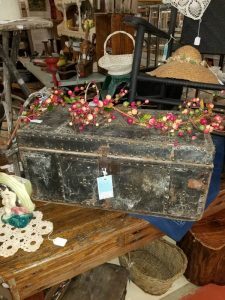 This trunk could be used with any decor. Dress it up or dress it. Use for extra storage, as a coffee table, as a toy box; a place to put your throw blankets, your spouse’s smelly shoes, your dog’s toys… endless possibilities.